Discussion in 'News - Breaking News & Political Forum' started by Kitamita, Feb 7, 2019. A screenshot taken on Thursday Feb.7, 2019 from an online fashion outlet showing a Gucci turtleneck black wool balaclava sweater for sale, that they recently pulled from its online and physical stores. 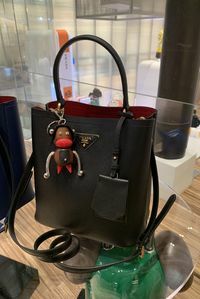 Prada will stop selling a $550 monkey figurine after social media users in the U.S. called out a strong resemblance to racist caricatures historically used to dehumanize black people. The monkeys are a part of Prada’s new “Pradamalia” line of small items like keychains and toys featuring cartoon creatures that come in several colors. The black and brown versions have oversized red lips, a traditional hallmark of blackface. The Devil is @Prada Really?! It’s 2018 & this is what you’re selling? #boycottprada @shaunking @soledadobrien have you seen this?! This marks the latest instance of a fashion house using imagery that’s at best tone-deaf, at worst, racist and exploitative. In November, Dolce & Gabbana angered Chinese customers with a video ad campaign that showed a Chinese model struggling to eat spaghetti and pizza with chopsticks. "Pradamalia" keychain on a bag. Swedish apparel chain Hennes & Mauritz AB apologized after it featured a black child modeling a hoodie with the text “Coolest monkey in the jungle.” Some of its South African stores were vandalized and had to be closed temporarily. The incident comes as Prada tries to plot its comeback. 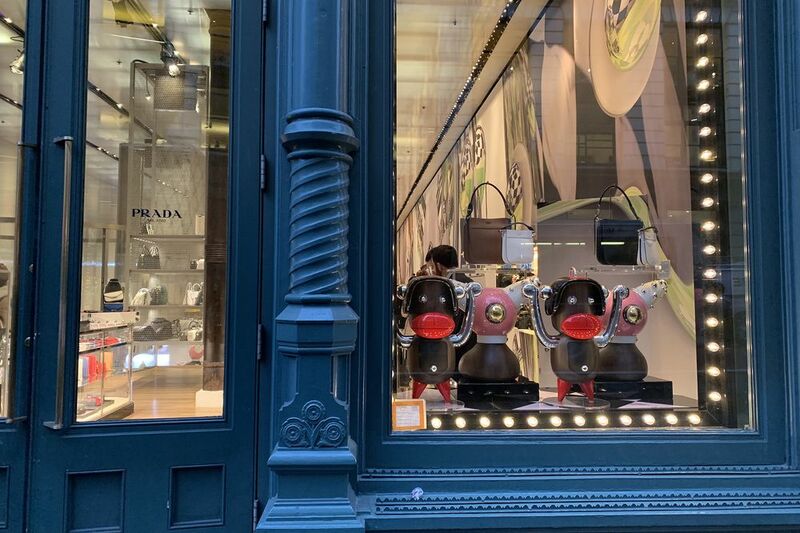 Prada, which is finally emerging from three years of falling profits set off by a slowdown in China and compounded by a failure to recognize that the internet had fundamentally transformed the luxury business, saw sales grow 9 percent in the first half of 2018. I saw the Gucci sweater on my FB timeline. I thought it was a satire. daoriginaldiva, brg240, Jas123 and 3 others like this. I can't see how anyone at Gucci thought that sweater was a good idea. Sanity, daoriginaldiva, Evolving78 and 12 others like this. This is why workplace diversity matters. No one in the room to tell these fools stunts like this are a bad idea and why. NikiD1908, Lady-RuffDiamond, daoriginaldiva and 18 others like this. No lie though... I have a coworker, sweet and lovely person, who is from China and uses chopsticks for everything and anything. She brings a lunch everyday and no matter what she brings, she has her chopsticks and a spoon. She will not touch her food with her hands or use a fork or knife. I've seen her use chopsticks for large fried chicken tenders, French fries, hot wings, pizza, apple slices, orange slices, little cupcakes, and potatoes chips. She's been in the US for a little more than 1 year now. Lady-RuffDiamond, Ganjababy, daoriginaldiva and 7 others like this. Exactly... if they had some black executives who were allowed to speak up without risking their jobs, this would not happen! daoriginaldiva, brg240, Ann816 and 7 others like this. I think they know. They WANT to do this. VeryBecoming, daoriginaldiva, nysister and 7 others like this. ^^^Basically. This is why going to school is fundamental for understanding how the world works: the same kids who use to bully others in class, become adults who run major companies and continue to bully others and countries at that. daoriginaldiva, Kitamita, nysister and 10 others like this. And black folks will still support them. I was so disgusted when I saw this I emailed it to my mother. I've never seen the monkey keychains before but clearly they knew after the outcry what they were doing yet here they come with this sweater. daoriginaldiva, nysister, Goombay_Summer and 3 others like this. Serious question: Are we as a people able to boycott anyone or anything anymore? Or have we become too spoiled and apathetic? He basically says he's not a follower and he does what he wants. Then he comes out with a fistful of money and lots of Gucci bags and makes a point of letting the TMZ dude know. I didn't watch all of it. Well, you can't bring everybody- some people will be left behind. Oh, Floyd, it's good that you are not a follower but you still are supporting a company that produced a shirt mocking your race/culture. Now you can be used by said company in their advertising campaign- See Floyd doesn't care, why should you? Good move there. Lady-RuffDiamond, LostInAdream, weaveadiva and 1 other person like this.